A burst pipe and major water leak left a hospital and Rugby School cut off and relying on reserve water supplies. Hospital of St Cross, on Barby Road, Rugby, had to use its reserve tanks and parts of the school's campus were without water for a short while. Severn Trent were able to temporarily divert water to the hospital site. The hospital said patient care was not affected by the leak and water levels and the reserve tank are being monitored. Nearby residents were also left without access to water for a short while. 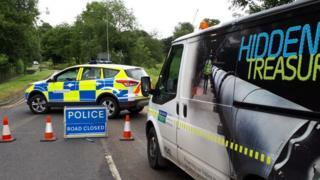 Police closed Barby Road, the main route to the hospital, at about 10:30 BST and posted on social media that there was no water at the hospital due to a burst main. The road remains closed for repairs due to water damage but the hospital said patients could still attend their appointments. At about 12:30 BST Severn Trent got the leak under control and directed water to another main to supply the hospital as well as residents and the school. The water supplier apologised for any inconvenience. A spokesperson for University Hospitals Coventry and Warwickshire (UHCW) NHS Trust said they are working with Severn Trent and the Highways agency "to restore normal levels of water to the site." "We are currently monitoring the water supply and reserve tanks at the site to ensure that the water supply is meeting demand. "Patient care has not been affected by this leak and patients should attend their appointments as normal".